University of Melbourne researcher Jenny Green explored the use of semiotics within Aboriginal cultures during a visit to the CDU Alice Springs campus on 10 September. An audience of more than 80 people heard about Jenny’s PhD research into semiotic interpretations within Aboriginal art, sign language and sand drawings and she used examples of the visual aspects of story-telling as a miniature stage set where a story unfolds. Examples are that the clearing of a space on the ground signals the beginning of a story. Erasure of the drawing space occurs when there are thematic shifts such as changes in time or location within a particular narrative. 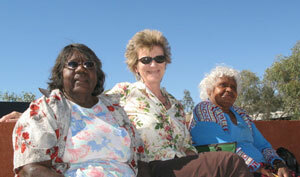 Jenny said she was thankful of the support of CDU and the Alice Springs community in attending her lecture. ‘After the session I realised the talks had clearly sparked off ideas in people,’ she said. Attendee Margaret Kemarre Turner OAM said it was important for children, Indigenous and others, to learn the stories behind local culture. ‘It’s important for kids and their teachers to learn the stories and what they mean,’ she said.